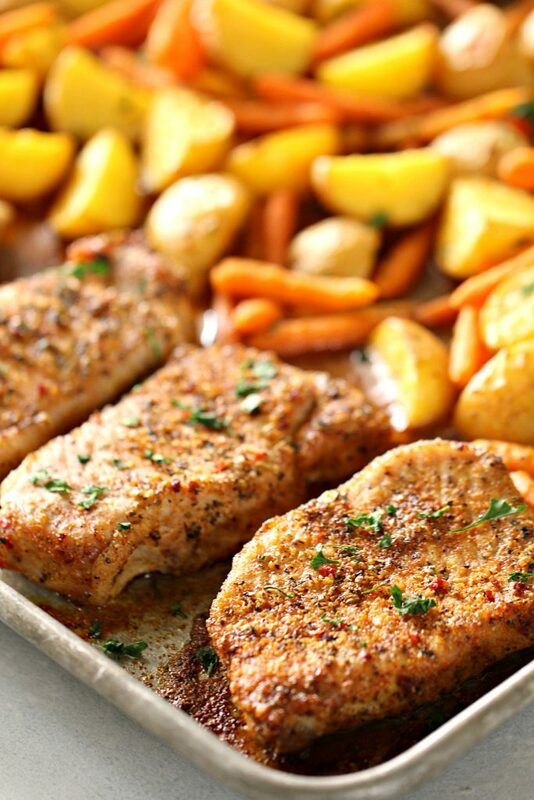 I love this Sheet Pan Pork Chops and Potatoes because dishes are a breeze. This one pan healthy vegetable and protein dinner will easily become a family favorite. It's easy to make and is a hit every time. I love those meals that can all be prepped and cooked in one pan. It makes dishes SO easy. For sheet pan recipes like this, I recommend using a large sheet pan with an edge. THIS ONE is one of my favorites. For even easier clean up, line your pan with aluminum foil. Step 2: Spray a large sheet pan with non-stick cooking spray. You could also lay down a sheet of aluminum foil for easier cleanup. This dish can get a little messy when the juices and seasonings mix. You could also spray the aluminum foil with non stick cooking spray, to avoid pulling up or cutting through the aluminum foil when getting the pork chops off the pan. Step 3: In a medium bowl, mix together olive oil, dressing mix packet, paprika, oregano, Parmesan cheese, salt and pepper. Step 4: Dip each pork chop in the oil mixture, making sure to coat both sides, and place on the prepared pan. Repeat with remaining pork chops. This step is best done with your hands. I tried using forks but it is difficult to flip and control without making a mess. Step 5: Add the potatoes and carrots to the sheet pan and drizzle any remaining olive oil mixture on top. Step 6: Toss lightly to mix together. I also did this step with my hands, but you could easily use a spatula or a spoon to spread and flip the potatoes in the mixture. Step 7: Bake for 35-40 minutes or until pork chops are full cooked. Step 8: Garnish with parsley and serve. Pork chops are naturally a drier meat when you cook them. However, you can make them a little more juicy. Pork chops are often pretty thick. I will usually place my pork chop on it’s curved side and cut them in half, to make them thinner. Then cook them for about half the time as directed. Pork chops can sometimes dry out when you cook them in the oven. But I have found that this recipe makes them moist and delicious every time. 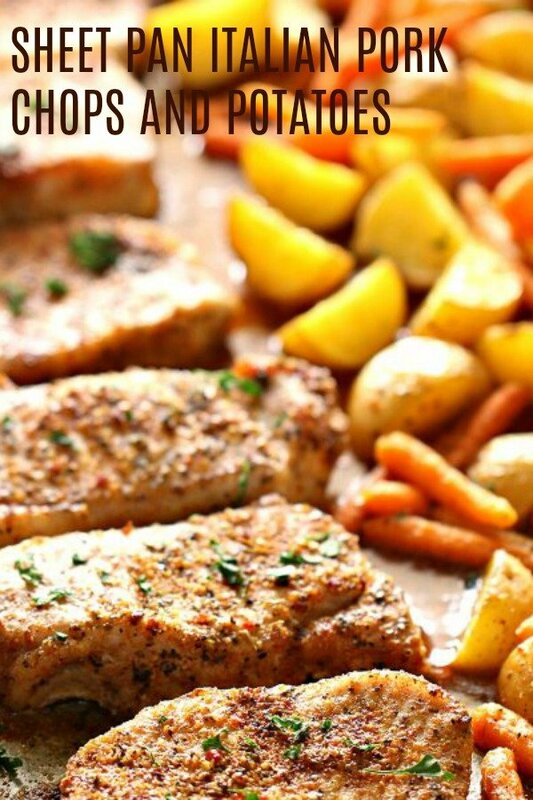 I have made this recipe a few times and have never had a problem with my pork chops getting dry. They are always juicy and a big hit. For this recipe, I used boneless pork chops that were about 3/4″ thick, so if yours are thicker or thinner than this, you will want to vary your cooking time. Preheat oven to 400 degrees. Spray a large sheet pan with non-stick cooking spray. In a medium bowl, mix together olive oil, dressing mix packet, paprika, oregano, Parmesan cheese, salt and pepper. Dip each pork chop in the oil mixture, making sure to coat both sides, and place on the prepared pan. Repeat with remaining pork chops. Add the potatoes and carrots to the sheet pan and drizzle any remaining olive oil mixture on top. Toss lightly to mix together. 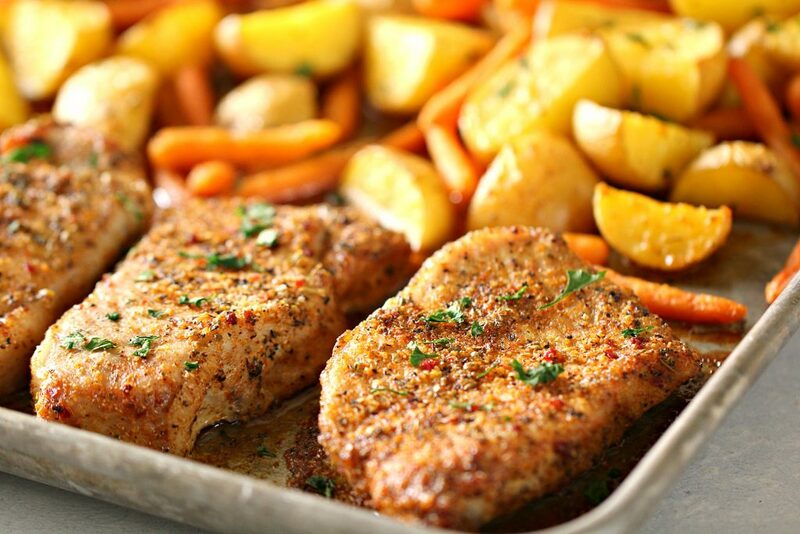 Bake for 35-40 minutes or until pork chops are full cooked. We have hundreds of delicious and simple recipes your family will love. We take you through each recipe, step by step, and show you exactly how to make it.